If you’ve been a follower of mine for a while you’ve noticed that I pick up new ventures pretty often. I’ve said for years that I’m ADD (I really think I am) and I get bored really easily. I constantly have to have a dozen balls up in the air, juggling all of them, or I’m not content. One of these days I’m going to sit and relax. Or hit the gym. That’s probably a better idea anyway. This week some friends of mine asked if I wanted to join this new 2nd and 3rd grade blog that they were starting. HECK YEAH! I’ve always been so overall focused on academics in my teaching career, that it’s going to take a bit of work for me to get focused, and stay focused, on just my kiddos and my classroom. I think focusing energy on a blog that’s right at my grade level is a great start. We’re doing a grand opening today (if it isn’t live right now, check back in a bit) and have some giveaways and TONS of freebies in store for you for the next few weeks. Just click the image below to head there. I also thought it’d be fun to link up with Cara at the First Grade Parade for this week’s Favorite Pins Friday. I’m constantly on Pinterest looking for fun stuff for teaching and the rest of my life. These are some of the highlights from this week’s pins. A teacher I worked with last year used desk fairy notes. I like this idea too. I want to do something to reward students for their clean desks. This just may be it! She has a ton of different ones for the seasons if you click the picture to check it out. I’m a little in love with Ladybug and everything she has in her room. I need to spend some time stalking it before I buy everything for the finishing touches in my room. One thing I’m still missing is a white board. I only have a chalkboard and I’d really like dry erase. Kristen recommends using Elmer’s Foam Boards and I might try that. Some others have also recommended that I use shower board. I need to make a trip to the hardware store soon to check it out. Miss Kindergarten just posted this fantastic idea! She gets new student bags ready so that when a new student walks in 24 minutes after the school day has started, you have most of what you need ready for him/her. My school’s population is pretty transient so I know I’ll need a few of these this year. I think that’s it for me for now! I have a jam packed weekend (I’m so much busier in the summer than the school year!). I have a wine tasting for a bachelorette party today then two baby showers this weekend. I hope your weekend is relaxing and enjoyable! I am obsessed with all things Ladybugs Teacher Files creates! I love the new student bags! Mine aren't nearly this cute . New project!! Great post! I love those new student bags, too! They are so precious. I made a few last year but sadly I didn't have 1 new student to use it on! I will definitely make more this year and I might just need to spruce it up a bit. Thanks for sharing that great find! I need to do new student bags! I say that I am every year and every year, I get a new student that I have to scramble and get things together for! I will do these this year! 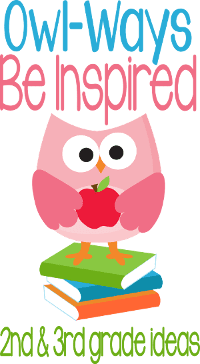 I am your newest follower…and I am following the owl-ways be inspired site, too!